Yes, getting carpets professionally cleaned aesthetically pleases you and your guests, but it has many other benefits! Small children and pets live with their face close to the ground and spend a lot of time on the floor. Meaning their faces are closer to nasty pollutants and allergens. It’s especially important to get the carpets professionally cleaned and vacuum frequently if your child has breathing issues. A soiled carpet can retain several sources of indoor air pollutants. In addition to regular dirt and dust, there may be pet dander, allergens, and other particle pollutants (Environmental Protection Agency). These airborne gases are considered toxic and attach to the particle pollutants and become trapped in the carpet. Then, the gases are released during vacuuming or even a regular walk across the carpet. To be clear, dust mites are not allergens. However, their body fragments and feces are. These mites and their components are easily released when the carpet is disturbed and they are easily inhaled. Since dust mites are microscopic most people are unaware of the infestation. 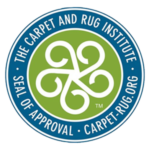 Carpets are at risk of developing mold after exposure to moisture. It’s imperative you remove the water and dry the carpet immediately upon spills or flooding. Even areas of high humidity are at risk for mold. After removing the contaminants listed above, the overall air quality in your home is much better. In fact, it’s recommended vacuuming three times a week and getting your carpet professionally cleaned every six months if you or someone in your home has asthma, allergies, or a condition causing breathing trouble. It’s essential to vacuum your home frequently. However, even frequent vacuuming cannot properly deep clean your carpet and upholstery. Furthermore, vacuuming cannot revive heavy “traffic lanes” in your carpeting. These are paths of frequently traveled carpet. You definitely notice them since these areas are much darker than the rest of your carpet. These areas are dirtier then the rest of your carpet and the carpet gets naturally deteriorated and torn by both dirt and being walked on.